These days, it seems that the publishing industry and the movie industry are so intertwined that they are almost one entity. It makes sense for advertising purposes. When there is hype and fanfare around a bestseller that is topping the charts and being spread by word of mouth, the movie version can capitalize on it. If it comes to the big screen quickly enough, it can utilize the advertising while the content is still fresh in everyone's mind. Whenever a big movie comes out that is based on a book, the book often will get promoted again. New cover art and branding make their way into bookstores. Famous actors smiling on the cover can bring new interest to a novel that was published some years ago. The implicit marketing of, 'well this book was "good enough" to be made into a movie so it's probably a decent read' will inevitably push some new sales so the book can reach a wider audience. Overall, I think this a good thing; it's hard to deny that reaching a wider audience for any piece of art, whether it be a movie or a book has any negative consequences. But which is "better"? The book or the movie? I will discuss a few thinking points on this subject. Over the years, I've heard many people say that they hold off seeing the movie until they have completely finished the book. Although books are often longer and more detailed versions of their visual counterparts, I don't tend to find that this strategy helps me enjoy the overall story any more. Sometimes the book is better and sometimes the movie is the better version. If we are talking about a book that was published a hundred years ago then it's a different matter. For me, holding off watching the movie these days only means being difficult when others want to go see the new blockbuster movie in the theater. What about spoilers? Will reading the book help you minimize endings or key plots being spoiled? In my experience I don't find this to be true. Whichever version you consume first, the ending of the other version will be spoiled for you. For certain stories once the ending is known the beginning and middle become uninteresting, sometimes to the point of being worthless to read. I like to think that books that are worth reading and movies that are worth watching have more substance than just their plot and ending. Otherwise we could just read summaries of what happened and be satisfied. If this was the case there would be no need for reading or watching movies at all. If finding out the ending or being exposed to spoilers ruins the story, it was probably not a great story to begin with. Are movies worse than books? I think there is a school of thought that is adamant in believing that movies are simply inherently worse than books. I am a strong believer that this is absolutely not true at all. To me, they are distinct forms of art, each with their own strengths and advantages. Movie makers such as Alfred Hitchcock and Stanley Kubrick created works that could hardly be "redone" in the same way and to the same level of quality as written word. The same goes for books. I hope that this discussion on books and movies has got you thinking about how you consume these stories. Are you a movie or a book person? Let me know in the comments below. 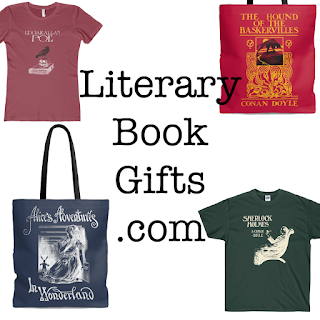 Written by Melissa Chan, designer at Literary Book Gifts, a store with tees and totes for book lovers. For moviegoers and readers alike, the promo code CPA20 can be used at checkout to receive 20% off on your order. This coupon code does not expire. Hello Melissa. I used to be one of those diehard believers that the book was always better than the movie and should be read first. I think I changed because so many books are made into movies these days that I could not keep up. Here is a cool story: the siblings in The Hate U Give (I have read the book, not seen the movie yet), were first introduced to Harry Potter because their mom brought home a DVD of the first movie. She got the DVD from a bargain bin. The kids liked the movie so much that they eventually read all 7 books in the series! So yeah, these days books and movies are a wonderful synergy of the arts. I find that the movie I create in my head when I read a book is almost always superior (in my estimation at least) to a movie on the screen, with the notable exception of some thriller or fantasy books. I guess my imagination is just not vivid enough to handle those plots! Most of the time, I like the books better but every once in awhile there's a movie that nails it and I like better or the same. I usually like reading the novel first -- for some reason it makes it fun seeing the scenes play out. Sometimes if I see the movie first, then for whatever reason I'm less likely to go back & read the book. Hmm. Still I'm a big movie fan.